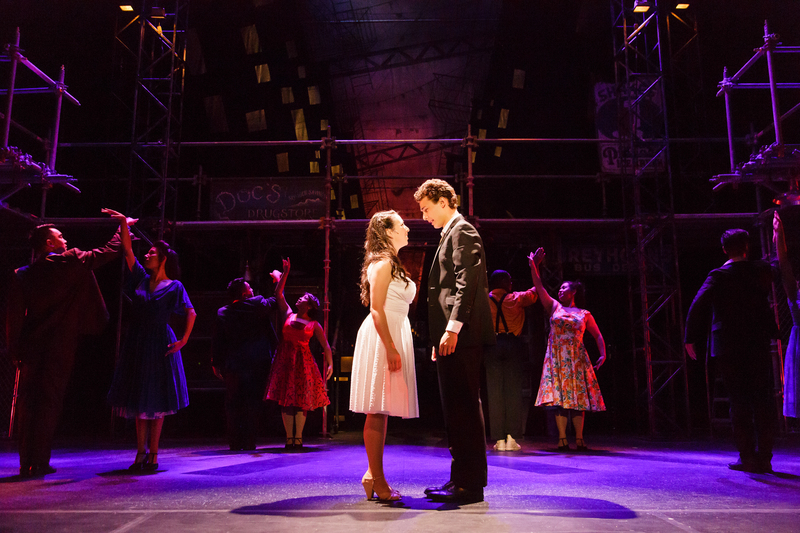 West Side Story first hit the Broadway stage in 1957, and this famous musical, with book by Arthur Larents and music by Leonard Bernstein, gave the youthful lyricist, Stephen Sondheim, his Broadway debut. The show was groundbreaking, particularly for its explosive action, and it was nominated for six Tony Awards. While the show won for Best Choreography and Best Scenic Design, alas, it lost the Best Musical Award to Meredith Willson’s The Music Man. Most theatre or movie aficionados are familiar with the show, its plot bringing the classic story of Romeo and Juliet to the current era when it debuted. Today, its tale of the star-crossed lovers from opposite gangs forms a period piece, keeping the tension and angst of the time alive, and Broadway By The Bay’s production is one to be treasured. The show is a tough one and is very demanding. Its acrobatic dance numbers (particularly if they take much of the original Jerome Robbins choreography) and challenging music with tricky rhythms and extremely difficult melodic and harmonic lines (compounded by formidable lyrics) must hit numerous emotional peaks. This all needs to coalesce and captivate the audience. The New York street gangs (the Jets and the Sharks) spend a good deal of time fighting and dancing. 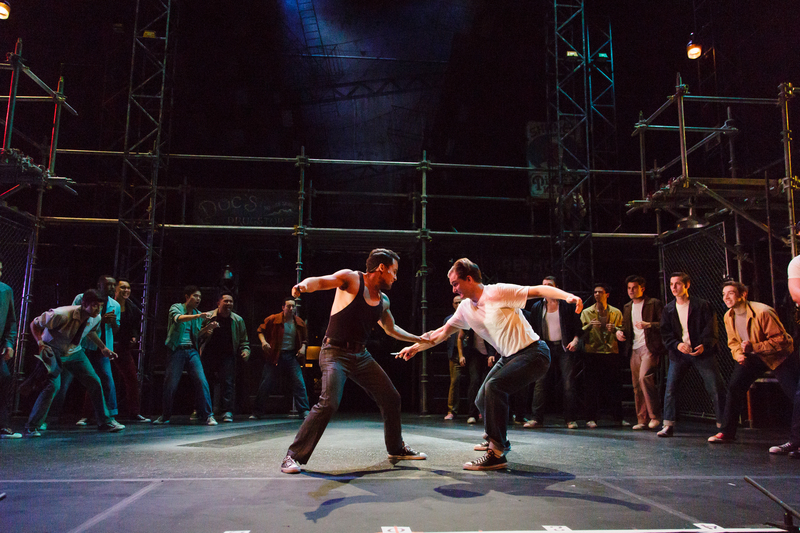 The original choreography and fight sequences by Nicole Helfer and Josh Marx borrow heavily from the Robbins style. They require precision, agility, and tremendous energy – energy that is contagious. Number after number, the dancers shine, as they tumble across, and above, the stage. Kelly James Tighe’s scenic design makes great use of the stage, giving the cast an impressive scaffolding network that forms the framework of the city. The set is recognizable in style compared to the original Broadway presentation. Small, movable set pieces show the locale of the scene, be it the gym, Maria’s bedroom, the bridal shop, or Doc’s fountain. Beyond that, large gates swing into place to form the neighborhood or the rumble location under the highway. It’s impressive how the agile gang members scamper around the scaffolding throughout the show. There are happy moments too, albeit short lived, and there is humor in all the right places. Director Amanda Folena’s staging works very well, hitting the right tones. She did a nice job of casting, with ill-fated lovers Tony (Nikita Burshteyn) and Maria (Samantha Cardenas) melting into each others’ arms and hearts while singing some lovely ballads. Anita (Taylor Iman Jones) runs the gamut from comedic highs when she first jokes with Maria early in Act 1, to raging fury, both in trying to convince Maria to give up on Tony and “find one of her own kind” and when she’s brutalized by the Jets when she comes to deliver an earnest message to Tony. Other standout performers include Bernardo (Alex Rodriguez) and Riff (Zachary Padlo) whose fights are deft, and believable. Padlo’s minor downfall is that he’s a bit pitchy during the “Jet Song”, but to be fair, that is an extremely tricky number. On the other hand, he’s very strong during “Cool” which also has several difficult passages. Anybodys (Jessica Rose Maxey) is nicely done as well. She’s the Jets’ wannabe-turned-mascot and Maxey handles the intricate leaps and bounds with aplomb with the rest of the Jets in several of their dance numbers. Beyond the individuals, both the men’s and women’s ensembles have great depth. The gang members believably display the racial disparity of the time. Though not completely authentic, the racial diversity within the Puerto Rican Sharks plays well against the more homogenous, lily-white appearing Jets. The other aspect of the gangs that reads very well is how comfortable the actors are with the period slang, making the dialog flow very smoothly. There were a few mishaps on opening night however. The sound execution was occasionally problematic such as at the top of Act 2 when Cardenas’ mike was out. Also, the sound balance was out of adjustment at times in some parts of the house, either between various cast members such as in the “Tonight” quintet, or between Sean Kana’s orchestra and the cast during a few more heavily orchestrated sections of some solos and duets. The sound problem was exacerbated for me because of an assisted hearing device being used by the patron seated directly in front of me. The device was turned up so loud that it created interference similar to what would be observed if a radio were turned on nearby, broadcasting the show with a slight delay. In addition, some of the diction was imprecise, particularly in the faster vocal numbers such as “America”, “I Feel Pretty”, and “Gee, Officer Krupke”, so many of the lyrics got lost. While the dance execution was phenomenal overall, the synchronization with the orchestra seemed off during “Gee, Officer Krupke” on opening night. As a result, many of the staged hits didn’t align with the percussion cues in that number. Overall, the orchestra is quite good with only a few momentary intonation lapses. While probably related to the overall sound balance issues on opening night, the reduced orchestration also causes a few of the more lush portions of the score to come across as a bit fragmented with some individual parts standing out more than they should. Of course the trademark licks, such as the famous sax solo in “The Prologue”, were very nicely done. Some of the synthesized sequences may also account for a few timbre oddities when not combined with acoustic instrumentation at times. In spite of the few problems noted, this is a solid production very much worth seeing. The show hits the emotional peaks, bringing the audience (most of whom clearly know what’s coming before it happens) to stunned silence as the tension mounts, delivering a powerful punch. Golden State Theatre, 417 Alvarado St, Monterey, CA, 4-13 September 2015. See http://broadwaybythebay.org or call (650)579-5565 for tickets or more information.